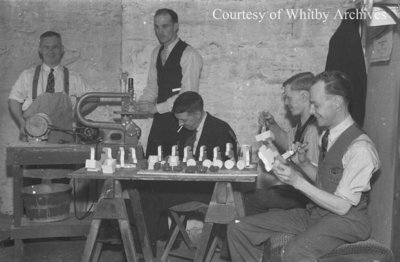 A black and white negative of unidentified members of the Craftsmen's Guild in Whitby, Ontario. In this view five members are working on crafts. Two men are standing and three are sitting down. Craftsmen's Guild, May 17, 1938, Marjorie Ruddy. Whitby Archives A2013_040_654A.